A spin-off of the popular Jabber/XMPP client Conversations with automatic contact discovery. Sign up with your phone number and Quicksy will automatically—based on the phone numbers in your address book—suggest possible contacts to you. You sign up with your phone number and Quicksy will automatically—based on the phone numbers in your address book—suggest possible contacts to you. Aside from the contact sync the user interface is deliberately as close to Conversations as possible. 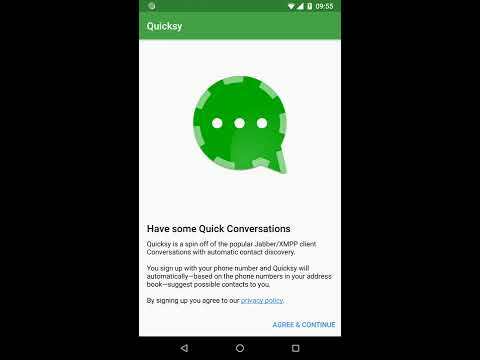 This allows users to eventually migrate from Quicksy to Conversations without having to relearn how the app works. Quicksy was added by pandalovfree in Jan 2019 and the latest update was made in Jan 2019. The list of alternatives was updated Apr 2019 There is a history of all activites on Quicksy in our Activity Log. It's possible to update the information on Quicksy or report it as discontinued, duplicated or spam. Maybe you want to be the first to submit a comment about Quicksy? Just click the button up to your right!